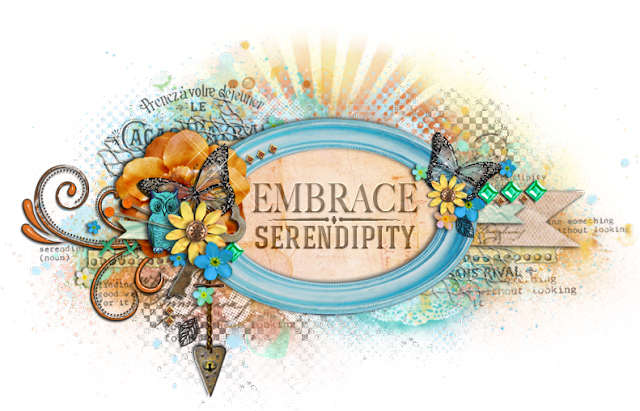 Welcome to my new blog--Embrace Serendipity! With a new home, I decided to acquire a new blog with one amazing make over. A very huge thank you to the talented Emma Stafrace for making this blog such a beautiful work of art! I'm in love with every single aspect of my new virtual home. So why Embrace Serendipity you may wonder? Well, serendipity is something that has added many wonderful things to my life. If you look up the definition for serendipity--it's defined as 'finding something good without looking for it'. That pretty much sums up the story of my life! I stumbled upon scrapbooking when I needed a creative escape, I discovered my day time job as a Quality Assurance Engineer without even knowing what a Quality Assurance Engineer was! I found my husband when I wasn't even looking for him. I uncovered an amazing love for dancing when I decided to take a Zumba class just because it 'looked like a lot of fun'! Now, I'm even a certified Zumba instructor. The list goes on...so as you can see, serendipity has played a big part in my life & that's how my new blog earned it's name. I'm still fine-tuning my new blog--but for the most part it's pretty complete. If you enjoyed my work on Kay's Kreative Korner--then please do remember to continue following me via Embrace Serendipity. I'll be back soon with a few older projects that I haven't been able to post & stay tuned for many new projects that are in the works for the near future! As soon as I saw your new blog open up I knew it was the work of Em...she does the most beautiful blog makeovers!! Wow!! Wow gorgeous blog makeover!! Love the name and the meaning behind it...wonderful!! I'm loving the blog header! This is a beautiful blog! Love all the fantastic details! And love the title! I believe in it completely! Beautiful Blog - will be following you here as well! Best of luck - thanks for sharing your creativity!